The successor to the OnePlus One in the form of the OnePlus Two is hugely anticipated and is set for a Q3 release this year. News and leaks so far have suggested that the new phone will be powered by a Snapdragon 810 processor. Now the OnePlus Two is the subject of a possible benchmark spot that tallies with this chip being used. Earlier this month we reported on the prospect of the Snapdragon 810 being used in the OnePlus Two, as well as a price indication. 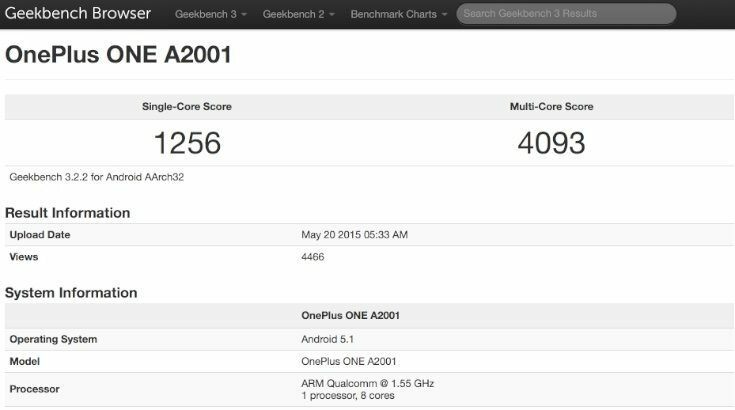 Now a device has shown up on the Geekbench benchmarking database that looks to be the OnePlus Two, although we can’t be 100% sure at this point. Intriguingly the handset is listed as the OnePlus One although this appears to be a red herring or error. We say this because the model number is different from that of the OnePlus One and also because of a processor discrepancy. The OnePlus One has model number A0001 but the handset now on Geekbench is model A2001. Also the OnePlus One is equipped with the Snapdragon 801 (MSM8974) quad-core chipset and the phone that has emerged on Geekbench shows the Snapdragon 810 octa-core (MSM8994). All the pointers then are that the new spot is for a prototype OnePlus Two, the first sign of the phone in benchmarking. Don’t take too much notice of the 1.55GHz processor speed shown for the Snapdragon 810 as it indicates that this testing was conducted with a cap at that speed. Other pieces of information shown are that the phone has 3GB of RAM and is running Android 5.1 Lollipop. If this is indeed the OnePlus 2, the RAM could be a bit disappointing for some as this chip could support 4GB. We should remember that nothing is set in stone just yet and that some aspects could be changed in time for the finished product. We’ve also heard previous rumors that the OnePlus Two will have a fingerprint sensor. We’ll be back with more on the upcoming smartphone as we hear it, and in the meantime we’d welcome your comments on this possible OnePlus Two benchmark appearance.